The neurotransmitter dopamine in the brain is critical to how we choose our everyday actions, by signaling our motivations and selecting appropriate movements. When dopamine function is disrupted, a range of psychomotor disorders can result that include addiction disorders and Parkinson’s disease. 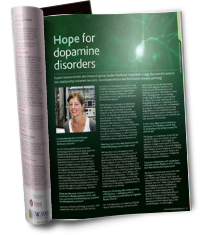 Our work explores how dopamine function is governed and dysregulated through study of dopamine transmission in real-time. Please get in touch if you’d like to find out how to join the lab. Pauses in Cholinergic Interneuron Activity Are Driven by Excitatory Input and Delayed Rectification, with Dopamine Modulation. Gating of dopamine transmission by calcium and axonal N-, Q-, T- and L-type voltage-gated calcium channels differs between striatal domains. Striatal dopamine release is triggered by synchronized activity in cholinergic interneurons. Inhibition of nigrostriatal dopamine release by striatal GABAA and GABAB receptors. October - Congratulations Gaya Karthik on passing her MSc viva! March - Congratulations to Dr Mark Condon on passing his DPhil viva! January - Welcome Stefania Vietti-Michelina! December - Congratulations to Dr Ben Hunn on passing his DPhil viva! October - Welcome to new lab members Dr Lauren Burgeno, Gaya Karthik and Ruth Siddorn! June - Welcome to FHS students Rebecca te Water Naude and Jess Larwood! February - Call for Symposia Proposals for Monitoring Molecules in Neuroscience 2018 in Oxford is now live! Submit by March 15th 2017. Belated welcome to Bradley Roberts and Ahmad Hneino! Dopamine neuron-derived IGF-1 controls dopamine neuron firing, skill learning, and exploration. Time-dependent assessment of stimulus-evoked regional dopamine release.